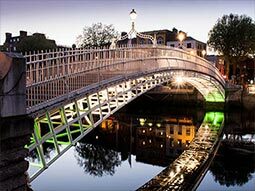 Unlike the tourist-filled Temple Bar, the likes of Harcourt, Wexford and Camden Street are cooler and edgier. This area is geared towards the locals, packed with students and young professionals. In fact, Dublin is home to Europe’s youngest, with 50% of the entire population under 25 years, and most of them celebrate around these streets. Wexford is the more alternative (pack those checked shirts and stick-on beards), hosting eclectic venues that host even bigger bands (along with Ed Sheeran). Camden is set down the road from Wexford, and is often referred to as the ‘Camden Mile’. 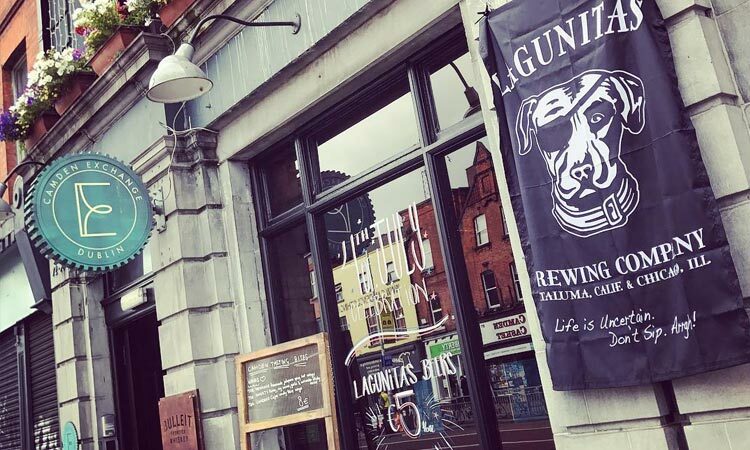 No less than two dozen bars call this ‘mile’ home, packed full of Dubliners, craft beers, the requisite live music and even one of the most significant pubs in the city. It has its own Wikipedia page… Harcourt Street is a little further down from Camden - still just a four minute walk from Wexford – and boasts some of our favourite hotels and adjoining clubs. 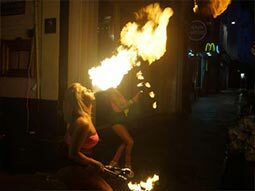 Those clubs also feature top beer gardens that spill out into the streets in summer. Wexford, Harcourt and Camden are the cooler older brothers to the Temple Bar. They are just as busy, with a more local and alternative crowd - celebrating way into the night. 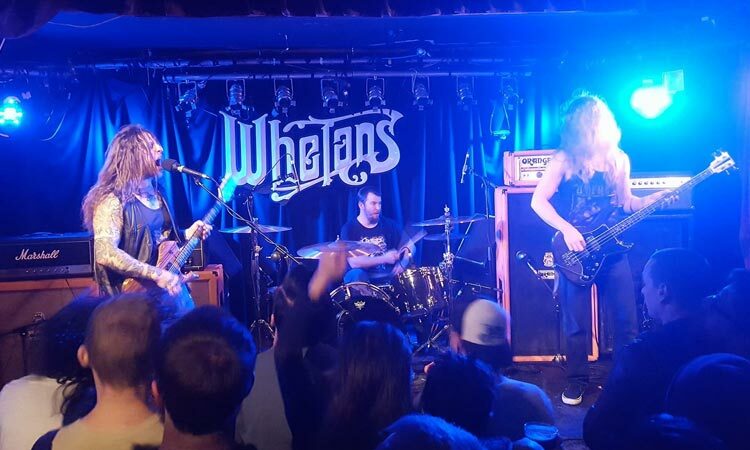 Wail loud for Whelan’s. You will be wailing along with biggest musicians and bands for decades. Ed Sheeran, Bloc Party and our favourite Yorkshire lads, Arctic Monkeys, have all performed on the big stage. That stage has even been used on the set of many films, so you’ll be in good company. 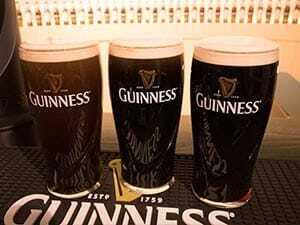 Whilst live music is its bread and butter, the club also has all of the necessary elements for a Dublin pub; Guinness by the barrel, cheap spirits, gorgeous Irish lasses and students. Although, the club is that much of an icon – it attracts anyone in their 20s/30s/40s/50s and 60s. Dtwo is Dublin nightlife personified. It’s loud, green and legendary, attracting every type of tourist and local you can imagine. 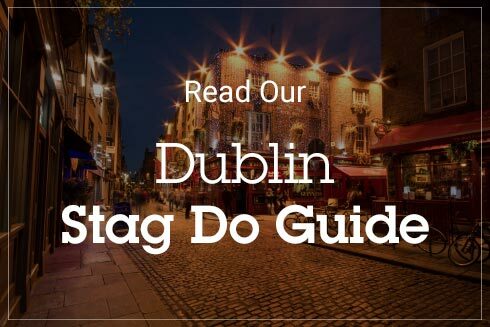 Located within the busy Harcourt Hotel – hugely popular with all of our stag and hen groups – this two-floor club, bar and beer garden is as much of an icon as Harcourt Street itself. The sports bar, also host to the hotel’s famous breakfast in the morning, is, naturally, your first stop – boasting 20 huge screens for live sports. 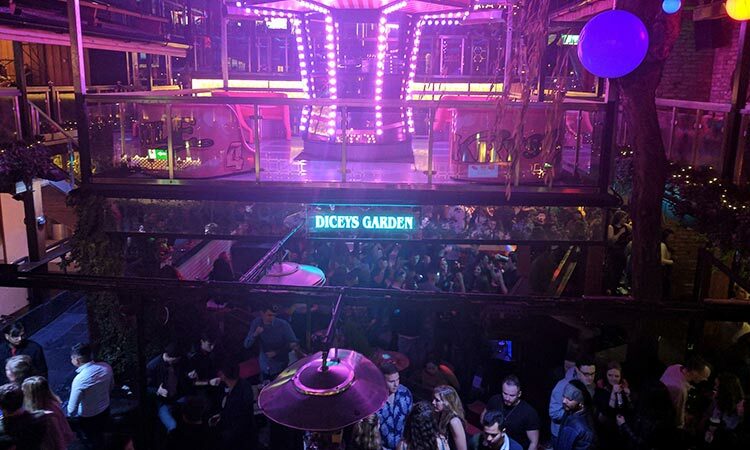 The basement club has a top DJ on every weekend and draws in the largest amount of people on a weekend. However, you’ve seen nothing yet until you step into the beer garden. The all-weather terrace is massive, with a capacity for 500. It’s so big, it has its own ‘Backyard BBQ’ serving burgers, kebabs and all the stodge you need at 2am, as well as an impressive rock wall and seating area. 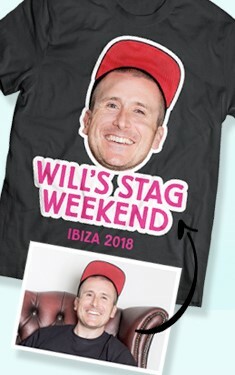 You want history on your stag do? Course you don’t, but you’ve got it at The Bleeding Horse. 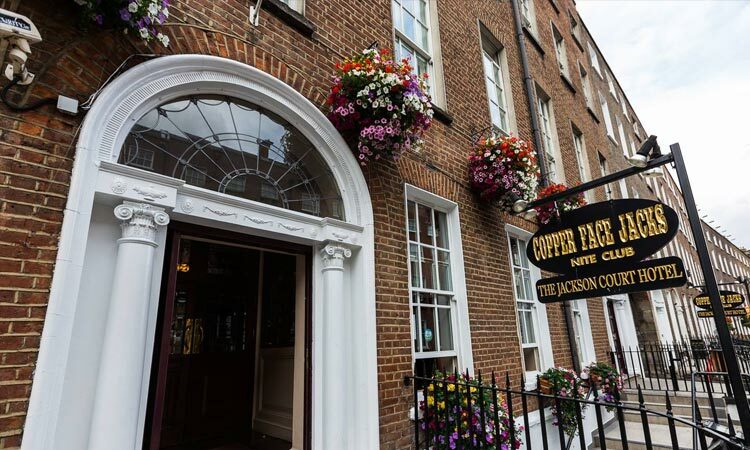 As one of the city’s oldest pubs, dating all the way back to 1649, this place has been making waves for centuries. It’s reminiscent of the Vikings set (for anyone who watches the show), with high ceilings, exposed timbers and a medieval-style banqueting hall. Along with all of that, it also has a Wikipedia page – this is definitely one for the history books. The pub is busy no matter the time or day, featuring a steady flow of after work drinkers, locals and tourists, before it really starts on the weekend. 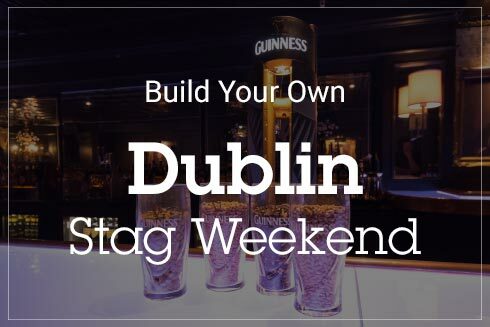 Those weekends also boasts live music sessions for that authentic Dublin stag weekend. Camden Exchange is a new-age inspired pub, a quirky addition to the already bursting Dublin pub scene. This building is well known around the capital as the old National Bank premises, and is another venue used as a filming location. Despite its traditional past, this eclectic pub is modern. So modern, in fact, that it has its own currency. Camden currency can be redeemed for offers, which run on a weekly basis, and you can check on social media for those offers. The pub serves all the requisites for a 21st century bar; craft beer, cask ales, street food and even hosts an artisan foodie market. It’s Dublin’s equivalent to the pubs in North London, with the addition of a huge bank safe in the middle of the bar. 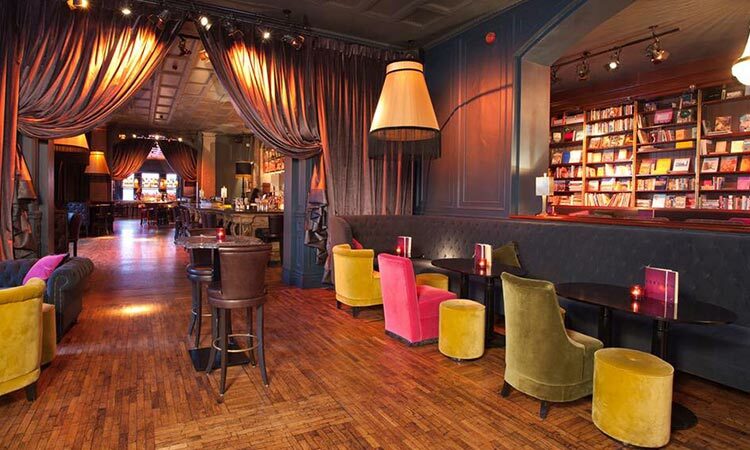 The Bernard Shaw is part of Dublin’s ‘hipsterdom’, rapidly taking over the city. It’s so popular that it’s regarded as the original hipster, and the reason growing a beard and checked shirts in Dublin are cool. Bernard is as quirky as he is popular, with the club a mix of venues from the likes of Berlin, Amsterdam and North London. The place is so ironic; the double decker bus – where you can eat tasty pizzas on the top deck – is relatively tame. However, if the bus seats don’t entice you, the rest of the beer garden will, regularly hosting flea markets (hipster) and boasting a pool table for when the Dublin sun is shining. The red Flannery’s is part of Dublin folklore; relatively unassuming from the front, but pure craic inside. 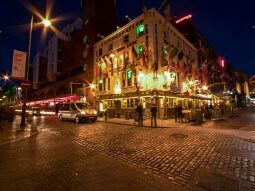 This is an institution for all who visit The Emerald Isle - part of the foundations of this nightlife district. 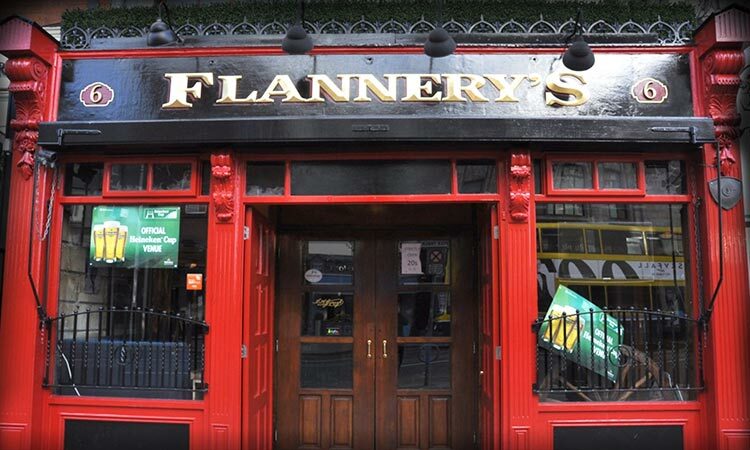 Flannery’s is multi-room and loud, with a main club and a huge beer garden. 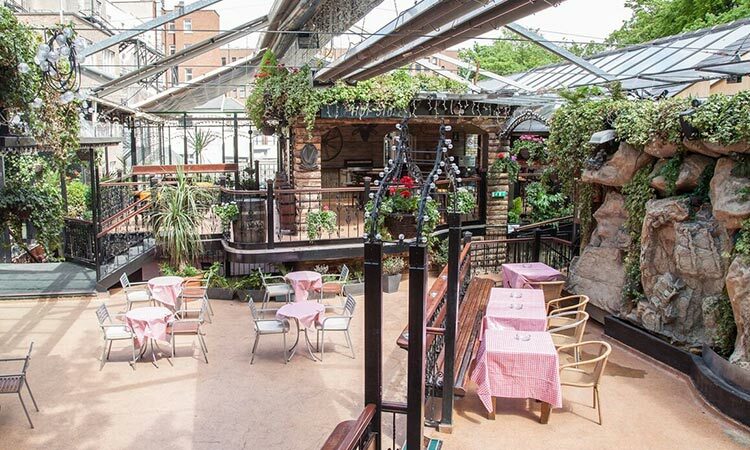 This is one of the biggest covered gardens in Dublin, with its own fully stocked and dedicated bar, as well as a whole load of seating. The Whiskey Bar, housed within the Vintage Bar, is one of those places for a sophisticated stag do… Kidding, but you can take your Father-in-Law. 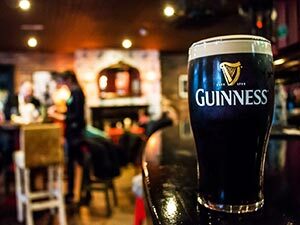 This boasts a massive selection of famous Irish brands, along with lesser known labels, all served in the comfort of a traditional bar. Roll the dice at Dicey’s Garden. 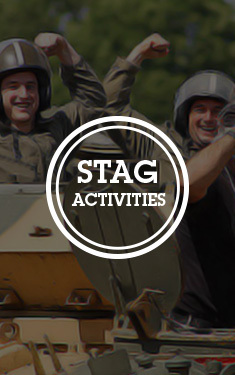 You don’t have to really, as there’s more than enough space to keep you entertained throughout your stag weekend. Dicey’s is part of three exciting venues, housed within the spectacular Russell Court Hotel. Krystle overlooks the beer garden, and is one of the best clubs on the street. Similarly, Bond nightclub is just as busy, and just a few yards from Krystle. 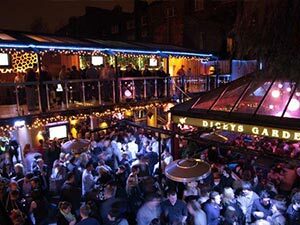 However, the star of the show is Dicey’s Garden – the ultimate, all-weather beer garden. The two-floor terrace has bags of craic and Guinness. 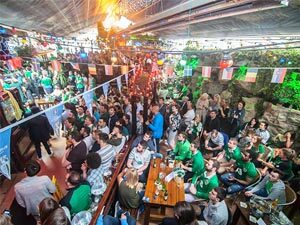 It’s got a bar, top DJs, regular barbecues and 23 screens to watch sport. It’s what stag do dreams were made of. Coppers, as it is affectionately known, is one club every stag do will end up in, no matter the people on the weekend. Featuring a main bar and dance floor, a basement bar and a fully heated and covered beer garden, as well as mews bar and residence bar – there’s no shortage of space for your weekend. This is just one of the reasons Coppers is so popular. That, and the adjoining hotel and drink offers due to the sheer amount of students passing through the doors. 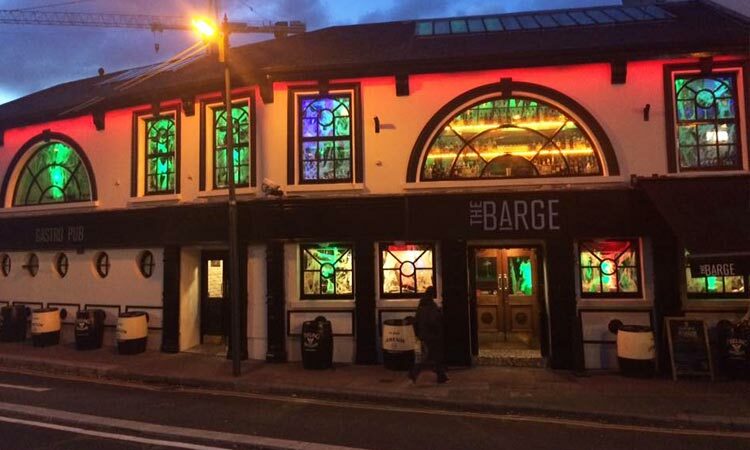 It’s part of teenage years legend for all Dubliners, forever instilled into the heart of locals, tourists and stag groups. Get ready for the ultimate stag night in Camden, Wexford and Harcourt. 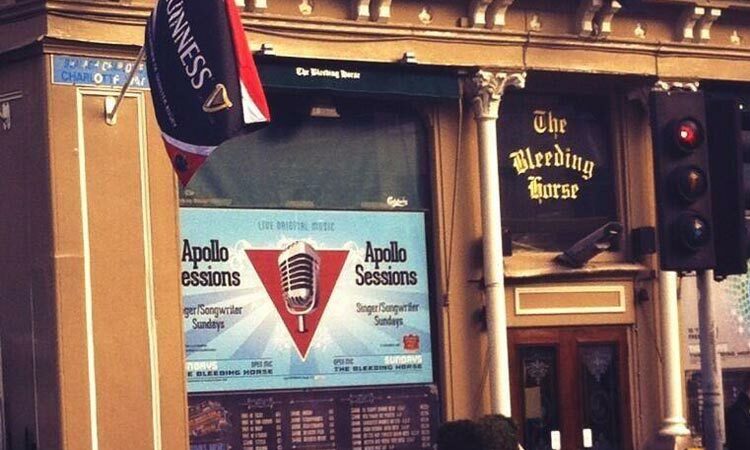 Dublin's famous for old-school boozers and we've rounded up the best in the city centre. 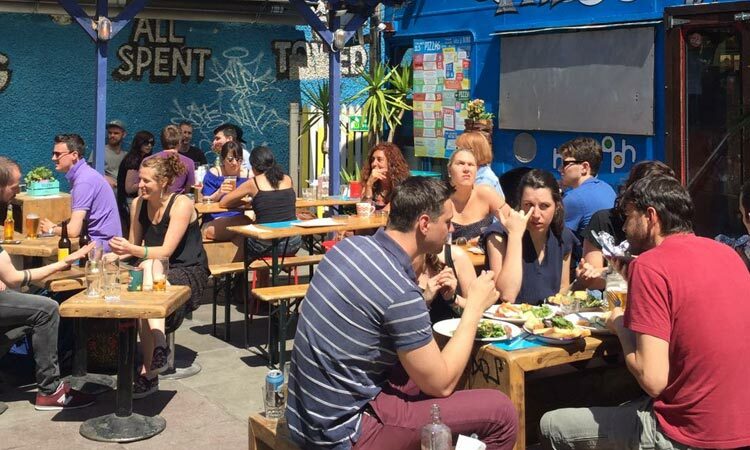 Enjoy the balmy Dublin weather (...) in the city's top beer gardens. 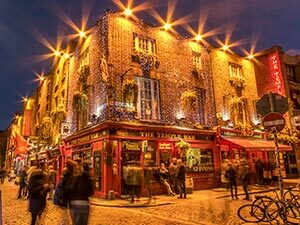 Experience Dublin's most famous nightlife district, the Temple Bar.